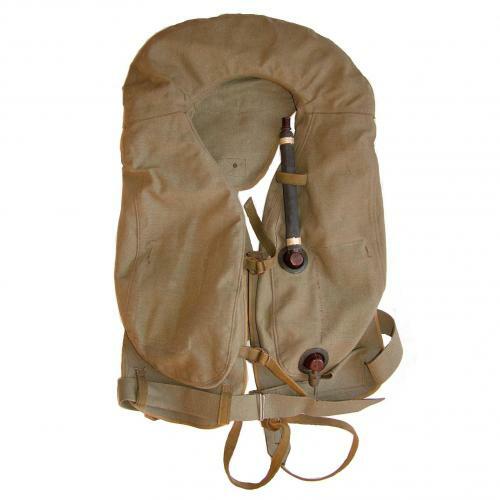 Unusual variant of the 10-30 B2 schwimmeweste manufactured in green rubberized canvas rather than the usual yellow. Later war specification plastic fittings on the inflation tube and CO2 bottle mounting point. The rubberized canvas is in very good overall condition. It remains flexible and is clean with good even colour. There would appear to have been two 'patches' on each of the front lobes at some point - now absent bar stitch marks/loose threads. The front straps/rings are present though the latter have surface corrosion. The waist belt and back strap are both complete and in good condition. Very good oral inflation tube/valve. The CO2 bottle is absent. There are no labels, stamps or identifying marks. Discussion with renowned authors Mick Prodger and Alberto Spaziani lead us to believe that this was probably made for the Luftwaffe under contract in an occupied Eastern European territory. Very good overall condition and an excellent display piece. Stock code MW20878.